Da Lat city is the provincial capital of Lam Dong Province, located on Lam Vien Plateau, in the Central Highlands, Vietnam. Since ancient times, this area is the habitat of the residents: Lach, Chil and Sre. 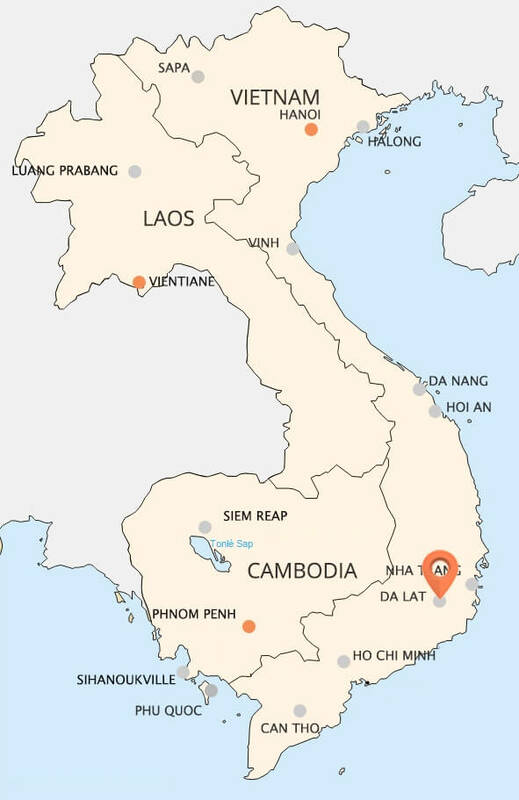 Late 19th century, while looking for a location to build the resort for the French in Indochina, Governor Paul Doumer had chosen Lam Vien Plateau at the request of the doctor Alexandre Yersin, who explorer arrived here in 1893. 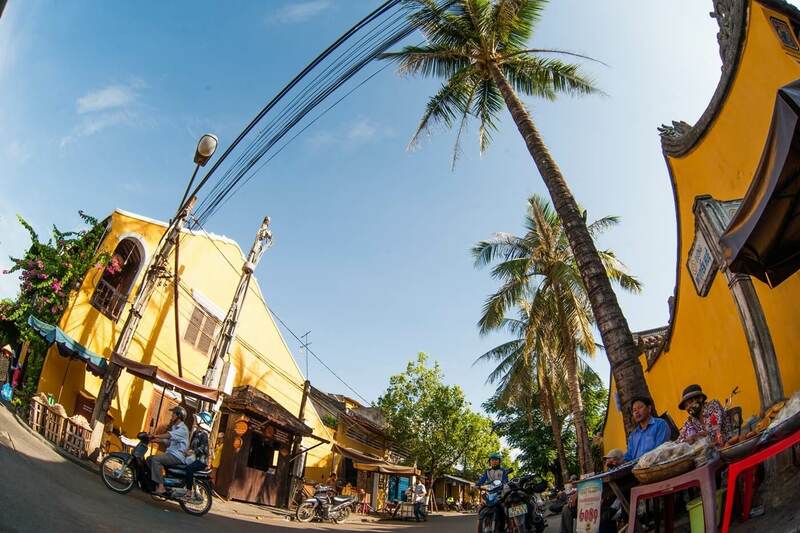 From a desolate place, the French planned and built up a city with villas, offices, hotels and schools, a center of tourism and education of Indochina at that time. It is the birth of a beautiful city we have today. With the altitude of 1,500 meters above sea level and near the mountains and forest’s flora populations around, Da Lat inherited a mountainous temperate and balmy climate throughout the year. The history lasting more than a century also left the city a valuable architectural heritage, like a museum of European architecture 20th century. Abundant Natural and humanistic resources help Da Lat become one of the famous tourist destinations in Vietnam, each year attracts millions of tourists to visit and vacation. 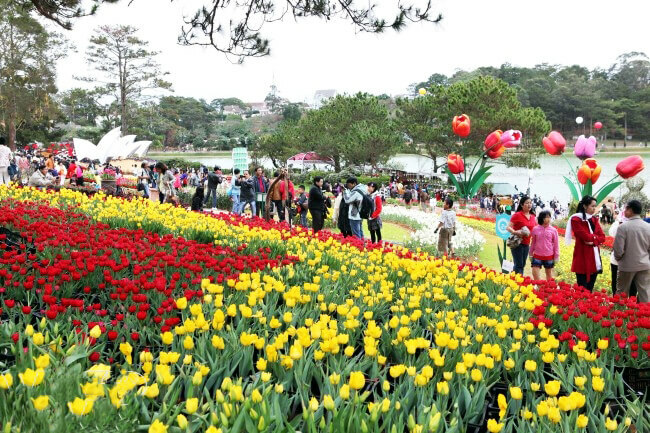 Visitors will certainly have memorable time in the City of Flower – Da Lat. 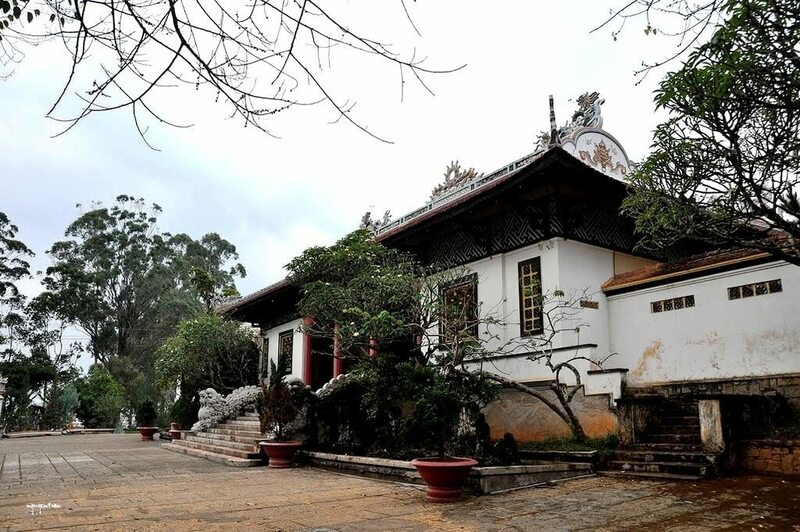 Truc Lam monastery is located on Phoenix mountain, above the Tuyen Lam Lake, about 5 km from the center of Da Lat city. This is not only the largest monastery in Lam Dong, but also the sight and worship place of many local and foreign tourists. This is one of the tourist destinations of Da Lat has the most number of guests to visit. This monastery was built on 8/4/1993 and finished on 08/02/1994, and then the first course started. The designer were Mr. Vu Xuan Hung, Mr. Tran Duc Loc and very famous architect – Mr. Ngo Viet Thu - who designed the Reunification Palace in Ho Chi Minh City. If tourists are traveling Tuyen Lam Lake they can walk up a slope has 140 stone steps to go through all three triple gates to go to visit the main hall. Inside the main hall of Truc Lam has Buddha Shakyamuni statues with 2 m high. The top main hall has the bas-relief carvings on 8 manifested generals of Buddha sophisticatedly. Outside the main hall was empty floor and steeple, inside the steeple is a 1.1 ton big bell, engraved with verses having very high moral sense. Flower garden of the monastery is one of the destinations tourists don’t want to missed and a rare flower garden having variety of exotic flowers collection. Truc Lam Monastary is really a peaceful place for everyone. Located about 25km from Da Lat, have a width of about 40 meters, a height over 30 meters, Elephant Falls has a beauty with absolutely no hand human intervention, a primtive beauty of this plateau. Thac Voi is translated from the name “Lieng Rowoa” of indigenous resident K'Ho. Standing on top of the falls looking down foot waterfall, visitors can see the rock shapes that look like elephant kneeling. If tourists wish to enjoy the full pristine beauty of the falls, they need to "conquer" 145 winding steps: it is natural stone steps "eating" into craggy cliffs, or planks of the petite wood bridge protruding side edge,… Far away there are thick forests with ancient trees hundreds of years old, stems and twigs with tangled vines. Noisy sound of waterfall with the rocks under it make people feel as if a herd of elephants running or hitting the fountain playing together. Down to foot of the waterfall, behind the launching waters is dee caves with full of mystery. That's the Bat Cave eating 50 m deep underground with cliffs has strange shapes, colors. The deeper visitors get down, the darker and colder the caves is. They gives visitors a sense of curiosity and enjoy watching. 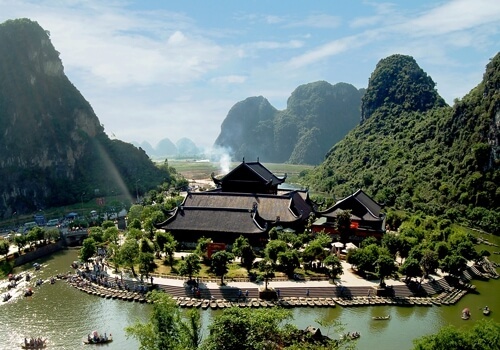 Although recently formed religious tourist attractions in recent years, but Elephant Falls is quickly recognized as the cultural monument - a national history by the grandeur of its own. Thien Vuong Co Sat Pagoda, also known as Tram Buddha Temple or Tau Temple, is located on Dragon hill, about 5 km from the center of Da Lat city to the northeast. 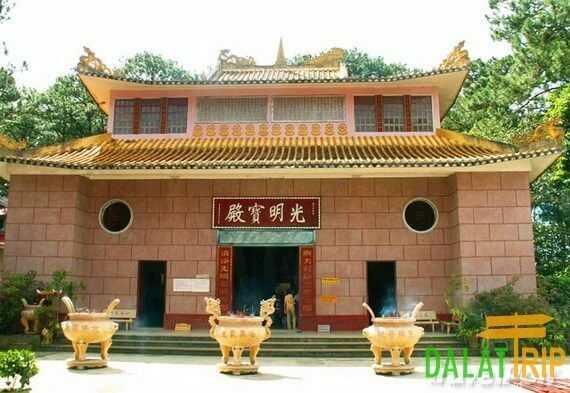 Thien Vuong Pagoda was built in 1958, with wooden building and roof. It is meticulously invested with sanctuary style, is a tourist attractions Dalat is also home to Buddhist ceremony. Although history of the temple is just about a century, this temple is really ancient and solemn. From the main gate after climbing the stairs of the temple is quite high and the car almost impossible to get, tourists walk up Tam Quan Gate to the Compassion Palace and right in the center is a statue of Buddha Maitreya 3m high, lacquered and trimmed with gold. Behind three cement censers is Quang Minh Palace, the main structure of the temple. The highlights here are three agarwood Buddha statues, each of them has a height of 4 m and a weight of 1,5 tons. They was brought back from Hong Kong in 1958 by Venerable Master Tho Da. That temple also has a magical turntable that automatically moves when visitors put their hand on it. This temple has the imprint of Chinese architecture style. This is a fascinating destination of Lam Dong and Da Lat city. 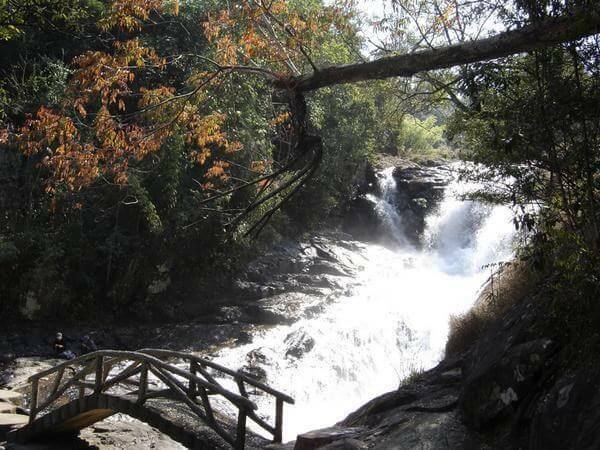 Datanla, a huge waterfall, is located in the tourist area Datanla, about 8 km from Prenn waterfall and 10 km from Da Lat city and an adventurous destination. Datanla Falls’ water is abudant because its upstream is very stable. Its waters fall from 20 m high, create a clear waters area called the Fairy Stream. Beside, there is a very deep part called the Abyss of Death. According to ancient legends, this dangerous abyss is the shelter of local ethnics’s army in the war with Cham people in many centuries ago. 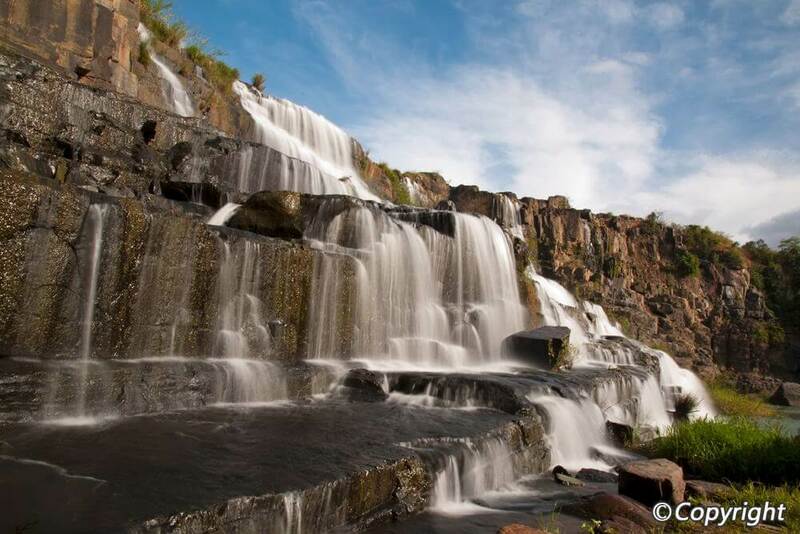 To conquer the waterfall, visitors can take the ramp has about 200 steps and have the opportunity to enjoy the landscape of surrounding mountains, enjoy the cool fresh air - typical of mountainous town. And another way to conquer it is using the chute system here. Datanla’s chutes system is considered the first modern chutes system installed in Vietnam. It has a length of 1000m winding slopes, has the sensor brake system to slow down its speed of the vehicles to keep a safe distance between them. For those who love the beauty of nature, has passion to conquer difficulties and challenges so Datanla Falls will be a new experience, should not be missed when visting the Flower City – Da Lat. Da Lat has many beautiful temples and each temple has a unique make it even more beautiful. One of them is Linh Son Pagoda. Linh Son Pagoda is located at 120 Nguyen Van Troi Street, Ward 2, Da Lat city, on a hill about 700 meters from center of the city to the northwest. The temple has solemn and ancient architecture, brings a peaceful to the guests to dispel fatigue. 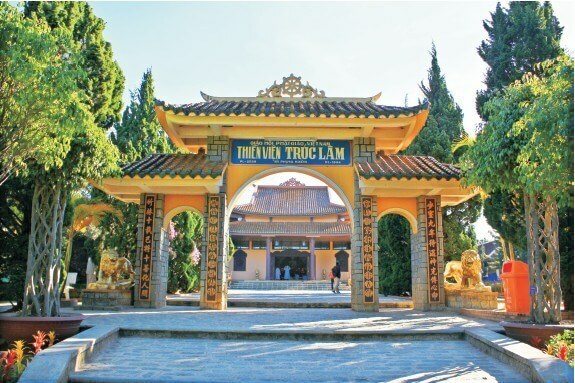 Built in 1940, Linh Son Pagoda is an architectural ensemble includes many items on an area of about 4 hectares. Linh Son Pagoda is also the head office of Lam Dong Province Buddhist Association. From the gates to go inside the temple, visitors follow steps, walk among pine trees, tall eucalyptus. Bodhisattva statue stands on a lotus are enshrined at front yard. On the right side is an octagonal three-level stupa, tile roof, 4m high. On the left is the lake with the beautiful rockery and bonsai. In the middle is the main hall. There are a pair of dragons in two sides of the steps, symbolize for God Dragon upholding Buddha. The front yard has various kinds of bonsai, make fresh and solemn space for the temple. This temple was built in the style of Asian: simple and harmonious. Linh Son Pagoda is a destination of this peach blossoms land. 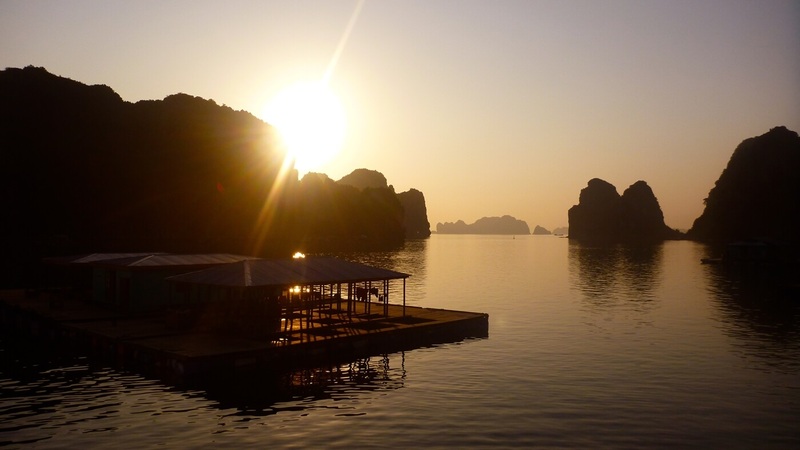 Every year, it welcomes thousands of tourists come to visit and worship.